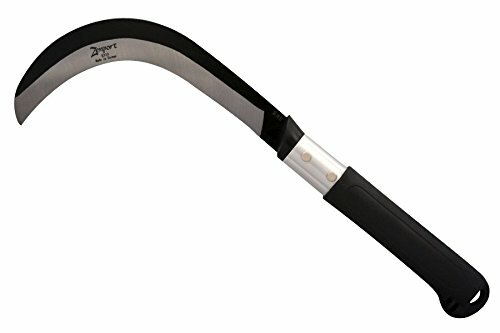 Zenport K310 brush clearing sickle with 9-inch aluminum handle & 9-inch SK5 Japanese high carbon steel blade. Designed for heavy duty clearing & scrubbing of tough vines weeds undergrowth & small saplings. Black Soft rubber grips & the 9-inch aluminum tube allows maximum leverage & force. Razor sharp 9-inch carbon steel straight edge hooked blade provides powerful cuts on stems stalks & branches. Also makes a great knife for harvesting a variety of fruits berries & vegetables. Overall tool length measures". If you have any questions about this product by Zenport, contact us by completing and submitting the form below. If you are looking for a specif part number, please include it with your message.